The idea of Pleistocene remains having "extremely active and mobile lives" is consistent with the hypothesis that people moved around during prehistory, and did not simply grow roots after their initial colonization of the planet, as some models of "Paleolithic continuity" have affirmed. Descriptions of Pleistocene activity patterns often derive from comparisons of long bone diaphyseal robusticity across contemporaneous fossilized hominins. The purpose of this study is to augment existing understanding of Pleistocene hominin mobility patterns by interpreting fossil variation through comparisons with a) living human athletes with known activity patterns, and b) Holocene foragers where descriptions of group-level activity patterns are available. 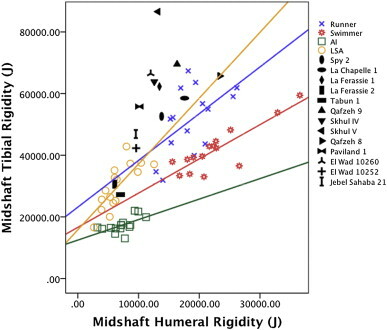 Relative tibial rigidity (midshaft tibial rigidity (J)/midshaft humeral rigidity (J)) was compared amongst Levantine and European Neandertals, Levantine and Upper Palaeolithic Homo sapiens, Holocene foragers and living human athletes and controls. Cross-country runners exhibit significantly (p < 0.05) greater relative tibial rigidity compared with swimmers, and higher values compared with controls. In contrast, swimmers displayed significantly (p < 0.05) lower relative tibial rigidity than both runners and controls. While variation exists among all Holocene H. sapiens, highly terrestrially mobile Later Stone Age (LSA) southern Africans and cross-country runners display the highest relative tibial rigidity, while maritime Andaman Islanders and swimmers display the lowest, with controls falling between. All fossil hominins displayed relative tibial rigidity that exceeded, or was similar to, the highly terrestrially mobile Later Stone Age southern Africans and modern human cross-country runners. The more extreme skeletal structure of most Neandertals and Levantine H. sapiens, as well as the odd Upper Palaeolithic individual, appears to reflect adaptation to intense and/or highly repetitive lower limb (relative to upper limb) loading. This loading may have been associated with bipedal travel, and appears to have been more strenuous than that encountered by even university varsity runners, and Holocene foragers with hunting grounds 2000–3000 square miles in size. Skeletal variation among the athletes and foraging groups is consistent with known or inferred activity profiles, which support the position that the Pleistocene remains reflect adaptation to extremely active and mobile lives. "the hypothesis that people moved around during prehistory, and did not simply grow roots after their initial colonization of the planet, as some models of 'Paleolithic continuity' have affirmed". The basis of virtually all my arguments with Maju. He is certainly one of the greatest exponents of the 'growing roots' theory I've ever had contact with. "The more extreme skeletal structure of most Neandertals and Levantine H. sapiens, as well as the odd Upper Palaeolithic individual, appears to reflect adaptation to intense and/or highly repetitive lower limb (relative to upper limb) loading". So the phenomenon was not confined just to the Upper Paleolithic but extends a considerable way back in our evolution. Was Homo floresiensis a cretin?